Dunwell Tech Inc is a technology service company focusing on exceptional service and custom solutions in technology and industrial related hardware and software. Dunwell Tech is the master distributor of the Dino-Lite digital microscope camera. Industrial camera bundled with Dino-Eye Premier AM4023CT which is a USB 2.0 powered device that has 1.3 megapixels of resolution that allows large detailed images without an existing microscope with picture sizes up to 1280 x 1024. Bundle includes MLGLM3 lens and MSA2M holster. This model has a MicroTouch trigger for capturing images without clicking on a mouse or using a keyboard. Integrate into your existing system or use with the MS35TA2 stand made specifically for this line of microscope cameras. 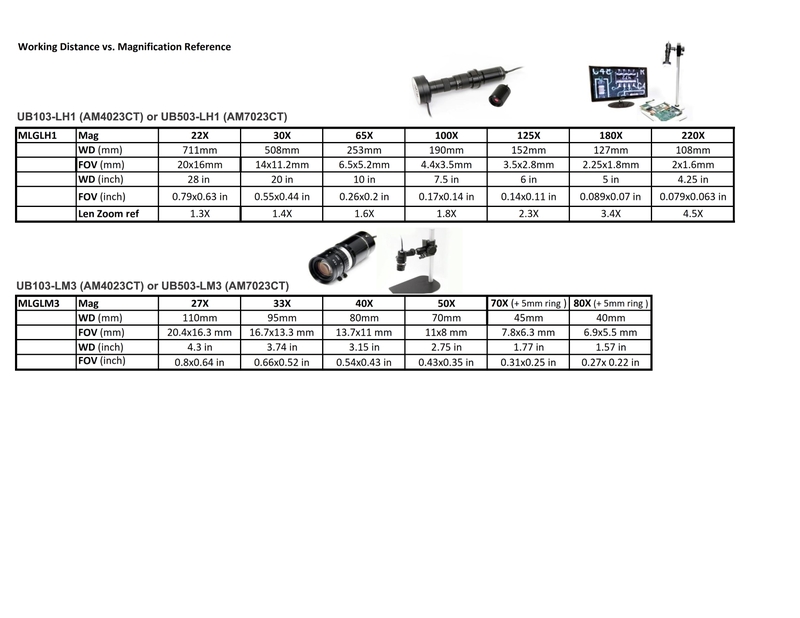 Depending on your distance from the object in view you can receive a magnification from 27x - 80x for more details see the link below for the Working Distance vs Magnification Reference Chart. To achieve 70x – 80x magnification with this model we have included a 5mm ring to increase the distance for optional use. With its USB interface, you can also easily and directly record images on your computer with the included DinoCapture software’s for PC or DinoXcope software for MAC. The UB103-LM3 Industrial Camera is a perfect companion for work, clinic, or laboratory using any device that can attach a C-Mount camera. The images of the observed product line or subject can be accurately displayed on the computer screen. The powerful, advanced software included with the camera ensures simple and convenient operation allowing easy capture of images from the microscope!